Blogger is an, easy to use, mainstream, blogging platform, but it has some drawbacks, among them the lack of blog templates. There are few templates to chose from. There are a number of sites ( ) that offers templates for Blogger but for the most part they provide templates for the old version of Blogger, and they don't support the new Blogger (ex Blogger beta) tags markup. The following is a very basic web application that based on a few parameters, and on the k2 base template generates a customized blogger template, and it's free! These are the required parameters to generate the template. Image URL. Web Address of the header image to use (ej: http://www.k2headers.misterdimbert.com/d/90-1/Fishing_01.jpg). Actually there are whole galleries of k2 template header images. The preview button allows to confirm the url is correct. 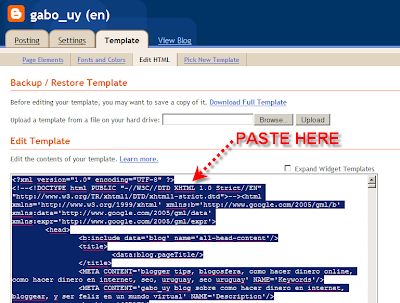 Once the template code has been generated, copy & paste it in the blog management console, in the Template/Edit html section. WARNING:Before updating your blog template it is advised to back it up, as well, as the content of all the defined widgets. A very good practice when customizing a blog template is to use a separate, sandbox blog to test and fine tune a blog template. Once changes are tested the can be commited to the target blog. When saving the new template you might be prompted with a warning, notifying that some widgets will be lost. This is an issue. 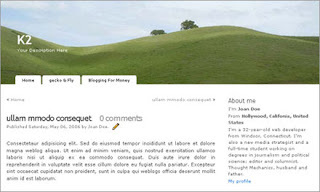 Widgets are declared in blogger templates, but widget content is stored in Blogger databases. There are two ways around this. One you take the loss and redefine them. The second you manually edit and update the template, copying the widgets markup from the template backup to the new template. If you ask me, recreating them is usually faster, make sure you've made a back up of the widgets content.